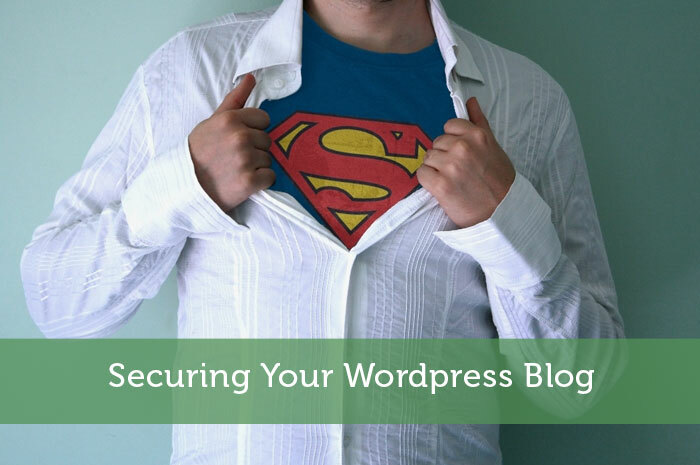 The following is a guest post about securing your wordpress blog. If interested in submitting a guest post, please read my guest post policy and then contact me. This week’s blogging tips post is something that I’ve been meaning to cover myself for a while now. As several bloggers happened to ask me about this lately, I knew I needed to stop procrastinating. Luckily for you, one of my good blogger friends volunteered to cover this topic. He’s a lot more knowledgeable than me when it comes to this stuff. So thank you for the awesome post Grayson! I’m sure this will be extremely useful for fellow bloggers. Hello everyone, it’s Grayson from Debt Roundup. Jeremy asked me to provide a write-up about how to protect your wordpress blog in order to give you guys a little more security. I hope this guide helps. I have been using wordpress every since it came out. I have been blogging for quite some time. There are many things that I love about using wordpress. It is really easy to start a blog and get your thoughts down. WordPress really does make it easy. One of it’s big problems is that hackers know how to break in. It is unfortunate, but part of the game. So, instead of just hoping that your site doesn’t get hacked, let me show you how to secure your wordpress blog. If you are just thinking about starting a blog and want to use a self-hosted version of wordpress, then first, congratulations! Second, let’s get your site secure from the start. It is much easier to secure your blog when you first install it, than worrying about it later. If you have a hosting provider that uses cPanel, then you can easily setup your wordpress blog with only a few clicks of a mouse. I love the convenience, but this process also only gives your site the basic setup. Here are some simple changes you should make when you are installing your blog. The table prefix is just about how the tables are named inside of your database. If you don’t know much about databases, than that is OK. Not many people understand how the wordpress database works. There is one thing that you can do when installing wordpress that can really reduce headaches later on. Change the table prefix. You can just create some crazy combination of letters and numbers to change your table prefix. When you do this during the install, then you don’t have to go back and change anything afterwards. It is super easy and very efficient. With the table names being changed, your site will be less likely to be hacked with simple SQL injection, which is a popular form of wordpress hacking. When you are setting up your blog, it asks you what you want to use as the administrator username. The default is “admin” and most people don’t change this. BAD Idea!! If someone wants to try to log into your site, then they will first try “admin” as the username. If you don’t change it, then they already have 50% of your login information. Now, they only have to figure out the password. This is how many sites are hacked. Change it when you are installing wordpress. It is up to you to create a good username and password. Don’t use “admin” and don’t use “password”. If you do, I am sure you will get hacked one day. If you already have a wordpress blog, but want to add some more security, then it can be done. There are a few things that you can do in order to tighten up the security. You can also change your table prefixes after you install wordpress, but it is a very different process and much more technical. I don’t recommend it unless you know how to mess with databases and phpMyAdmin. If you want to learn how to do it, I am going to break down the process now. **Important** – Backup your wordpress database before you do any of these steps. As I indicated before, it will default to “wp_”, so in this file, you can change it to something like shown above. Now, you probably see more tables in your database structure and that is usually because of your plugins. So, you will need to get those table names and add them using the same code as above. You will put all of your table names into the same format as above and then execute it. You will need to check the options table to make sure there are no instances of the old table prefix “wp_”. Here is a SQL query that will look for you. This query will return some results and you will have to go one by one and change the wp_ to the new table prefix. This could take some time. You will also have to go one by one through each result and change “wp_” to the new prefix. Once you are complete, go to your website and make sure everything works. You can see now that it takes much more effort to change your table prefix after you install wordpress. Either way, changing the table prefixes is a great way to keep your site safe from hacking. Do you know if people are trying to login to your site? Have you installed any log in analyzing plugins to see if people are brute forcing their way into your site? No? Well, you should! Brute force attacks are simple, yet effective. Your wp-login.php file is a default for wordpress and hackers know this as well. They can create scripts that will continuously go to your login page and try to force their way into your site. If you don’t lock down how many times they can try to login, then they can keep trying. I have seen some scripts try to login every 10 seconds. It can do a number on your web hosting server. With this plugin, you can lock people down that repeatedly try to log into your site. You can see from the above screenshot that there are a few options. This plugin has been tested on wordpress 3.6 and it still works just fine. One of the better features is that you can get emails depending on how many lockouts people have. You will be able to see what username they tried to use and how many attempts they made. It gives you a wealth of insight into what is happening on your site. If you don’t allow people to register on your website, then you should make sure that you uncheck that setting in the General settings within wordpress. If this is the case, then one of the best ways to make sure people can’t login to your site with brute force attacks is to password-protect your wp-login.php file. There are quite a few articles on the web that tell you to password-protect your wp-admin folder, but I strongly discourage this. There are many plugins that use the wp-admin folder location and when you password-protect it, the plugin will break. If you notice when you try to login to your site by going to domain.com/wp-admin/, you will be redirected to wp-login.php. So, you need to lock down your wp-login.php file and I will show you how. To start this, you need to create a file called “.wpadmin”, which will need to be uploaded to your home directory. Make sure there is a period before the “wpadmin”.I recommend doing this via FTP, since it is much easier. Now, what do you need to put in this file? Simple…..
Go to this htpasswd generator site to create your username and password. This should NOT be the same as your wordpress admin login and password. This site will encrypt your password, so if someone found this file, they wouldn’t be able to crack your password. Copy the line of text that they give you into your new “.wpadmin” file and save it. You will then upload this file to your web hosting server in the home directory. When I say home directory, I do not mean the public_html location. People can get anything in the public_html directory, but it is much harder to get anything in the home directory. Now, make sure that you put your username in the “username” section of the AuthUserFile. You can get this from your web host if you don’t know it. Save your .htaccess file and then re-upload it back onto your server where you wordpress installation is. Now, when you go to yourdomain.com/wp-admin/ to log in, you will have to put the username and password that you created on the website above. If correct, you will be allowed access to actually login to your site with your original wordpress admin login information. I am sure that some of the things in this guide might be over your head, but they are really important to do. How would you feel if you have worked really hard and created a lot of posts on your site and then all of the sudden, your site gets hacked. I have had it happen to me back in the day and there is nothing fun about it. These security steps can really make your life much easier. If you have any questions or need help with this, let me know in the comments below or you can hire me to help you out. Thanks for posting this Jeremy. I hope it is able to help out those that want some more security. To all of those that will tell me about plugins that will help secure. I am well aware of them. These tactics (besides the limit login attempts) are done on the server and database side where you don’t have to worry about a plugin messing up or not being updated. Limiting log in attempts is a great to protect your blog. I use a plugin called Log In Lock Down. Also you may want to remove the WordPress Log In link on your site as well. Good one Chris. That meta widget should be the first thing everyone removes. So unnecessary! Glad to hear it. It does make sleeping much easier when you know that your blog is less likely to be hacked. Great post Grayson! You’re right, just a bit of it was over my head. 🙂 That said, I think it’s increasingly important to focus on security of your site, especially if you’re in it for the long haul. It’s crazy how many people will stick with the admin & password as their logins for their site and are just asking to be hacked. In regards to the limit login attempts settings, what would you say generally are good numbers to put in the options section? I would only allow people to try to log in 3 times. The lockout time could be 30 minutes, where they can come back in 30 and then try to log in again. I would then allow them 2 or 3 lockouts and then push them out for 24 hours. Eek! I never even considered that someone might hack into my blog. A lot of this is over my head, but I’ll go through this one step at a time to ensure it is done! You should always be aware of this. There are hackers probably doing it right now. They can easily find blogs and they don’t care what it is about. If you need any assistance, please let me know. Great post Grayson. It’s a bit technical, but will surely help those who want to secure their WordPress Blog especially nowadays that we really need to secure anything we have online. Of course it is technical. I tried to put some graphics in there to make it easier to follow. If you have any questions about it, please let me know. Wow, someones wants to hack MY blog? I’m flattered. If I had a stalker, they’d probably become my friend. I wouldn’t be flattered. It happens to almost every wordpress blog. They just want to get in and then flood your site with spammy links. Good luck with it. That is what most people think, but spammers just want easy links to their site. Hacking wordpress is easy enough for them. All great tips. The Better WP Security plugin will also do much of this for you. But I can’t stress enough the author’s earlier point – MAKE SURE YOU RUN A BACKUP FIRST. While that plugin will do much of this for you, you are relying on the plugin, which is a security risk in itself. Most plugins that change table prefixes and redirect people away from the login pages have had issues in the past. If the plugin has a venerability due to some code issue, then you could be hacked. These steps are done on your server, so you are much less likely to have issues. Limit Login Attempts seems pretty cool. We shall now see if any baddies get locked out. Thanks for the tip. You will probably find a few people getting locked out. Good luck with it Bryce. Yup. Already had someone from France trying to log in as admin 6 times. (I removed admin from the account when I first set up my blog.) I set the lockout at 3 unsuccessful attempts. I their attack script will get discouraged after it has been locked out for 24 hours. Thanks for the plugin tip. Well, that was quick. I am sure they have been trying to hack the account all of this time. Glad to see that you are seeing it in action. I admittedly don’t know much about wordpress. Tanya takes care of it for me, but she did tell me that we had a couple of sustained brute force attacks over Labor Day weekend. I think she used the plug-in you mentioned and we use hard log-ins and passwords too. I appreciate your tips and will send this info to Tanya. Good to hear that you have someone watching it for you. There are many hackers out there. Hope he doesn’t find anyone trying to get in. When I start writing about things that interest me, it is hard for me to stop. Glad it was useful. Awesome information. I know I need to beef up the security around my site. There is just so much to poke around in that I wasn’t really sure where to start. Now I have a good starting point. Thanks. Hopefully this will help you get started. Good luck and let me know if you have any questions about it. Whilst I do most of these, there are a few things in there that I haven’t done yet or didn’t know about. Will get cracking right away!! Good luck with getting them done. It is good that you are being proactive. I never thought about all this security stuff. I’m glad you posted this as this is not something we think of every day. Now I’m gonna double check. Thanks. You are most welcome. This is not something that many think about, but the reality is that hacking is all around us. It is better to be prepared. Great tips! I’m so glad that you have this knowledge in your brain so you can help those of us who are less tech savvy. Thanks Cat. I appreciate the kind words. If you rename all of your tables, will WP automatically update itself with the new names or will you have to manually update those connections? You have to rename the tables in your database, then update that in your options file. WordPress runs almost entirely off of the database and that is where most of the stuff lives. Once you update the tables as described, then you should be good to go. I’ve always changed the prefix when setting up WordPress. I don’t use random strings, but I do make sure the prefix is meaningful to me and noone else. As long as it is different, you should be good to go. I am so good with certain softwares, especially in the desktop publishing realm, but with things involving the web, it is so over my head! I never really considered hackers being a problem with my blog but considering people got into my pinterest account, you should never take anything for granted. Thanks for this article! Glad I could spark the thought. Hackers are a problem, especially with wordpress blogs. I had no idea about any of this when I set up WordPress, and most of the after the fact stuff might as well be written in Chinese for as much as I understand it. However, I can use plugins, so thanks for that recommendation! Plugins do help, but I tend not to use many of them because I have to rely on someone else to keep up. Thanks for posting this. These are things often overlooked by bloggers (although I don’t know why). You are welcome and your comment speaks true.